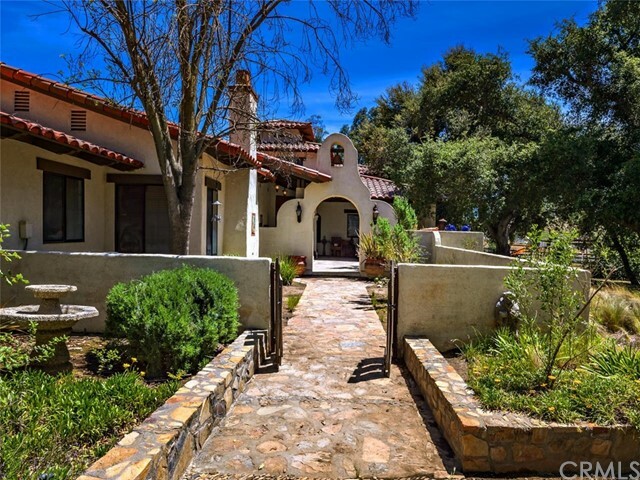 REDUCED $250,000...Spanish Hacienda...Pool...Barn...Arena...Welcome to this Spanish inspired estate on a fabulous usable five acre parcel. A court yard entry takes one into a well thought out home offering saltio and custom Hickory hand hewn hardwood flooring, wrought iron staircase, granite and stone counters and showers, Knotty Alder cabinetry, five fireplaces and a large game room with kitchenette. Beamed ceilings and hand troweled plastered walls add to the ambiance. The kitchen includes Viking appliances and commercial style range. There is an attached living quarters for guests with its own entry and garage.The pool and spa are in its own private courtyard with outdoor kitchen, fireplace and trellis covered patios. Custom barn with additional turn outs and a 115&apos;x220&apos; arena, round pen and pasture area. There is a well for irrigation. Come and enjoy the good life!